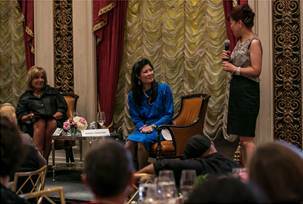 Pulitzer Prize-winning journalist and best-selling author Sheryl WuDunn alongside Patricia de Stacy Harrison, President and CEO of the Corporation for Public Broadcasting, discussed the Half the Sky movement, which addresses the oppression of women worldwide and opportunities for their empowerment. WuDunn explained that it will take a combination of legal reform and political will to implement laws protecting women, but that change can happen if issues such as forced prostitution, gender-based violence, and maternal mortality are addressed head-on. WuDunn and Harrison shared a piece of the landmark 2012 Corporation for Public Broadcasting documentary inspired by the Half the Sky book. 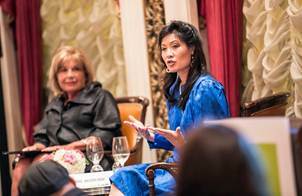 Sheryl WuDunn shares success stories coming out of the Half the Sky campaign. Beijing Managing Partner Jun Wei closes the evening with Sheryl WuDunn and Patricia de Stacy Harrison, thanking them for participating in the Summit and enlightening the audience on global challenges.